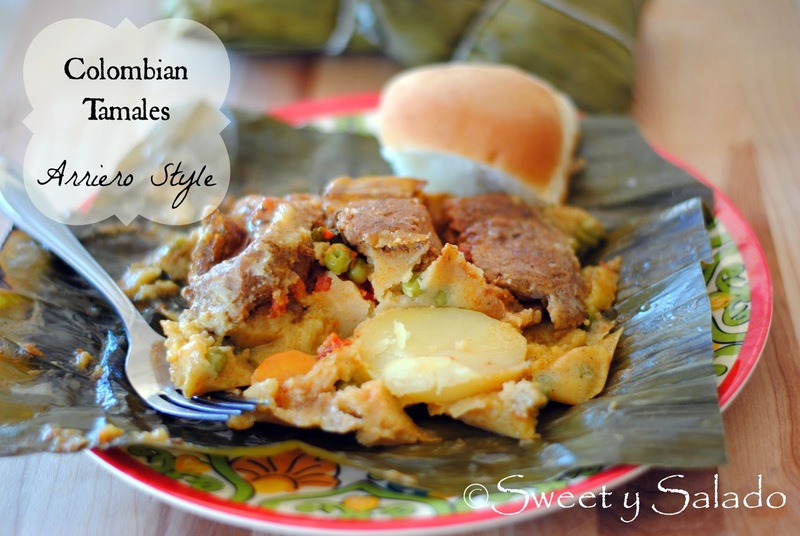 It is no surprise that the number one recipe I am asked about from my readers and YouTube subscribers is Colombian tamales. Why? Because they’re simply out of this world delicious! And just like empanadas, buñuelos and natilla, they are very popular during the Christmas season. Colombian tamales are so popular that you will find different types of tamales all over the country such as Tolimenses (from the department of Tolima), Santafereños (from the departments of Cundinamarca and Boyacá), hayacas (from the Llanos Orientales or Eastern Plains), Arrieros (from Colombia’s coffee region and Antioquia), among others. Each version has different ingredients and different ways of making them but the two things they have in common are the use of corn meal and banana leaves to wrap them. Because recipes also very from family to family or one person to another, I was not able to learn how to really make them until I made them with my husband’s family some years ago in Colombia. Whenever I asked people for their recipe or technique, they would give me this long list of ingredients and instructions which were very hard to understand for some reason. Another thing they were not specific about was whether they were boiled or steamed and how long I needed to cook them for. So, of course, every time I tried to make them myself I would fail miserably. The one thing I did while I made them with my husband’s family was pay attention to everything my mother-in-law was telling my sisters-in-law and my husband, “clean the leaves really well so they’re not dirty”, “make sure the guiso doesn’t stick to the pan”, “don’t let the dough dry out too much” and “make sure each onehas a sprig of parsley”, which is her own personal touch. I kept mental notes of everything we did that day and my sister-in-law, Doris, also gave me a typed recipe of the tamales we had made, which were AMAZING! Time consuming of course, but so worth it! The recipe I’m sharing with you today is based on the recipe of the tamales my husband grew up eating with a few minor changes of my own. And in case you were wondering, they are steamed so that water doesn’t get into the tamales during the cooking process making them bland and watery. Mystery solved! 1. The night before, blend all the marinade ingredients in a blender or food processor. 2. Put the pork meat in one or two large bowls and add the marinade. Cover and refrigerate overnight. 3. If you’re using frozen banana leaves, you can thaw them out by leaving them in the fridge overnight. 1. Carefully take the leaves out of the bag and cut them into rectangles, approx. 20 inches long (50 cm). 2. Clean both sides of each leaf with a damp cloth or paper towel. If the leaves are stiff, you can pass them through a stove burner set to medium low for a few seconds to soften them. This also helps to avoid cracks. 3. Peel and cut the potatoes into thick slices and place them in water in a medium bowl. Season the water with salt and the all-purpose seasoning to taste if you want. 4. Peel and cut the carrots into slices and place them in water in a small container. Season the water with salt to taste if you want. 5. In a large pan, heat the olive oil at medium low heat and add the onion, garlic, red bell pepper, chicken bouillon, all-purpose seasoning, and salt and pepper. Stir well and cook for about 5 minutes or until the vegetables soften. 6. Add the tomatoes, reduce the heat to low and cook for about 10 minutes or until the sauce thickens. Add a bit of water if the sauce dries up. 7. Place the water for the masa in a large pot, add the chicken bouillon, all-purpose seasoning, onion powder, garlic powder and salt. Heat the water on the stove without bringing it to a boil. Then, slowly add the pre-cooked corn meal and stir with a spatula or wooden spoon until it looks like thick oatmeal. If the masa dries up, you can add more water. 8. Add the peas to the masa, stir well and remove from the stove. 9. Place one or two banana leaves on a flat surface with the lines or veins facing up. If you’re using two leaves, make sure only the borders overlap. 10. Spread about about ¼ cup of masa over the leaf with a spoon. 11. Add one tbsp of guiso over the masa. 12. Place on sprig of parsley over the guiso. 13. Place 2 potato slices and 2 carrot carrot slices in the masa. 14. Place 1 piece of pork rib, 1 piece of pork meat and 1 piece of pork belly over the masa. 15. 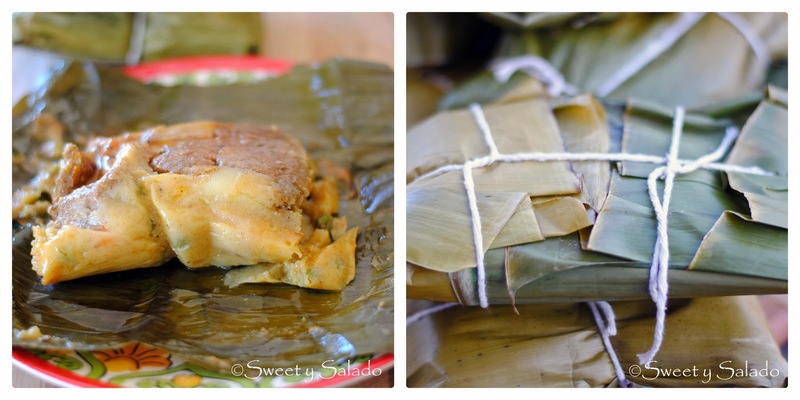 Close the tamal by putting the sides of the leaf together in the center and tucking them in, fold in the top and bottom sides as well. Tie them up with butcher string. 16. Repeat this process with every single tamal. 17. Fill ¼ of a large pot (tamalera) with water and season with salt. Bring water to a boil and then place a steam rack inside the pot to avoid letting the tamales touch the bottom or the water. **Note: If you don’t have a steam rack you can place sticks or left over banana leaves in the bottom of the pot instead. 18. Place the tamales on the steam rack one on top of the other and steam them on low heat for about 1 hour and 45 minutes to 2 hours. Check the water level every 30 minutes to prevent it from evaporating completely. 19. Once the tamales are ready, take them out and let them rest for a few minutes. 20. Unwrap the tamales and serve them with dinner rolls and hot chocolate for breakfast. They can also be served with hogao or Colombian hot sauce. Thank you for making it! I'm so glad you liked the recipe. =)You can boil the tamales in water, and in fact, many people do, the reason I don't is because I find that no matter how tight you wrap them, you still get some amount of water inside the tamales, this not only makes them watery, but bland as well. But like I said, if you want, you can boil them instead of steaming them.I usually reheat my tamales in the microwave for a few minutes, that saves me a lot of time. Other people steam them again in a smaller pot for about 15-20 minutes. If you want to freeze them, the best way is to do it before cooking. This masa (dough) tends to get dry and lose its texture quickly, so if you freeze them after they're cooked, you are going to end up with a dry, crumbly dough. What I do is wrap each tamal individually with plastic wrap and them store them in a resealable bag, that way air doesn't get it. Then I just steam them as usual and they taste just as good. No need to thaw them out, by the way. Hola! I have a friend that doesn't eat meat but loves seafood. What would you recommend as a seafood filling and how long the cooking time would be since seafood cooks quicker then meat. Hola! I have a friend that doesn't eat meat but eats seafood. What would you recommend as a filling for the tamales and also a cooking time since seafood cooks quicker. Thanks so much! Hi there! A pressure cooker wouldn't really work for me because I like to steam the tamales and not submerge them in water. I used to cook them in water and it all seep in and wash away all the seasoning leaving them really bland.